When you think about people like Rube Waddell, and there were lots of other off-beat characters around then, also, you start to get some idea of how different it all used to be. Baseball players weren't too much accented in those days, either, you know. We were considered pretty crude. Couldn't get into the best hotels and all that. And when we did get into a good hotel, they wouldn't boast about having us. Like, if we went into the hotel dining room - in a good hotel, that is - they'd quick shove us way back in the corner at the very end of the dining room so we wouldn't be too conspicuous. "Here come the ballplayers!" you know, and back in the corner we'd go. I remember once - I think it was in 1903 - I was with the Detroit club, and we all went into the dining room ia this hotel, I believe in St. Louis. Well, this dining room had a tile floor, made out of little square tiles. We sat there - way down at the end, as usual - for about 20 minutes and couldn't get any waiters. They wouldn't pay any attention to us at all. Remember Kid Elberfeld? He was playing shortstop for us then, a tough little guy. Later he played for many years with the Yankees, up on the hilltop. Anyway, Kid Elberfeld says, "I'll get you some waiters, fellows" Darned if he didn't take one of the plates and sail it way up ia the air, and when it came down on that tile floor it smashed into a million pieces. In that quiet, refined dining room it sounded like The Charge of the Light Brigade. Sure enough, we had four or five waiters around there in no time. Yeah, Kid Elberfeld, what a character he was. Kid Gleason was on the Detroit club about then, too. Another rugged little guy. Do you know that those guys actually tried to get hit with the ball when they were up at bat? They didn't care. They had it down to a fine art, you know. They'd look like they were trying to get out of the way, but they'd manage to let the ball just nick them. Anything to get on base. That was all part of the game then. Of course, they weren't called the Yankees then. We were called the New York Highlanders, because we played in a little park - it only seated about 15,000 - located at 168th Street and Broadway, which was on pretty high ground. You could look from the stands and see all the way down the Hudson River. Sometimes we were called the Hilltoppers. The Highlanders had a pretty good team when I joined them in 1909. We ended fifth in 1909, and second behind the Athletics in 1910. 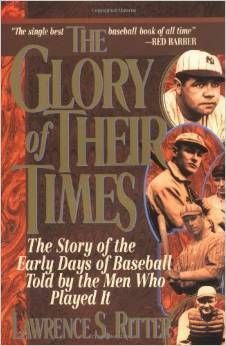 Three real old-timers were on that club when I got there: Willie Keeler, Kid Elberfeld, and Jack Chesbro. Gee, they were great fellows. They were all close to forty by then, and they didn't play much longer, but I got a thrill just being on the same team with them. You know, you hear all that stuff about the old-timers being so rough on rookies in those days. Well, you can't prove it by me. Those guys were swell to me. Wee Willie Keeler was still a pretty good ballplayer, even thea. He could loop 'em over the infield better than anybody I ever saw. Wonderful fellow. I was too shy to say anything to him, but he came to me one day and said, "Jim, you've got a great career ahead of you. If I can help you in any way, you just say the word How about that? And Kid Elberfeld. Golly, I was out after the Kid's third-base job, but he always treated me fine. One day the Kid got in a hassle with Tim Hurst, the tough old umpire, and got suspended for five days and was fined 50 bucks. The Kid slid into second base, safe on a double, sure as could be, and Tim, who was umpiring behind the plate, called it a foul ball. Well, the Kid started arguing with Tim, and while he's talking he's all the while jabbing Tim in the belly with his finger. Finally, Tim took his mask off and whammo! He whacked it right across the Kid's nose. After they separated them, they were both suspended. Anyway, the point of all this is that George Stallings, who was our manager then, put me ia at third base while the Kid was out. And do you know that Elberfeld insisted on me sleeping in a lower berth on the train. The lower berths were for the regulars. Us second-stringers slept in the uppers. I was climbing into my upper one night, after I'd been in there at third base a few days, and the Kid saw me. He grabbed me by the ankles and said, "Where do you think you're going?" "This is my berth " I said. "The hell it is" he said. "The hell it ain't" I said. "I've had it ever since I've been with the club"
"Well, you're not going to have it anymore" he says. He marched me over to the club secretary and says, "Put the youngster down in a lower berth. Take mine if you have to. He's playing every day, bustling like the devil out there, and he needs his rest" That's the way the old-timers treated a rookie in those days. At least that's the way they treated me. Stallings was a fine manager. One of the best. Like I said, we finished in second place in 1910, and you've got to say he deserved a lot of the credit for that. Talk about cussing! Golly, he had 'em all beat. He cussed something awful. Once, in a game, he gave me a real going over. Later that night he called me in and said, "Jim, I'm sorry about this afternoon. Don't pay any attention to me when I say those things. Just forget it. It's only because I get so excited and want to win so bad."